Christmas in a tropical country like Costa Rica is a show. Lights and huge decorations almost make the tax season and hellish traffic bearable. Even though we only get slightly chilly trade winds in December, fake snow magically appears on Christmas trees and in the nativity scenes throughout the country. It’s lovely because the charm of the holiday season in San José is that the air smells less like a city and more like a warm pot of tamales, Christmas delicacies that resemble a doughy corn empanada. You can eat a tamal almost anywhere when Christmastime comes around gets, but I started wondering why it’s so unusual to have a glass of rompope (eggnog) outside your home? Rompope was created by Mexican nuns in the colonial period — ironic because they weren’t allowed to drink it. Because of this old tradition, Mexico also sells a lot of different kinds of rompope in their supermarkets. In contrast, in Costa Rica, we usually can buy just one kind, Dos Pinos. This year, I tried so hard to find a place to sit and drink the traditional Christmas punch that I almost missed the one coffee shop that mixes it with cocoa, dark chocolate and a heavy handful of creamy foam: Cabra Negra, across from Boliche Dent in San Pedro. My first plan was to buy some artisan-made bottled rompope and have a home tasting, with fruit cake or some other sweet treat. My second plan was to try vegan rompope from a juice bar. That seemed more interesting to write about. But I decided against the vegan option knowing that rompope is basically a blend of milk and eggs, delicately brewed — patience is the most important ingredient of traditional rompope — with spices and spiked up with guaro. I came across the Cabra Negra coffee shop spontaneously after a Christmas shopping session. Apparently, I’m best friends with one of the first fans of the voluptuous Rompope-based drink, Pastorcillo (meaning little shepherd in Spanish), Cabra Negra’s seasonal drink that doesn’t look like anything on their usual menu. 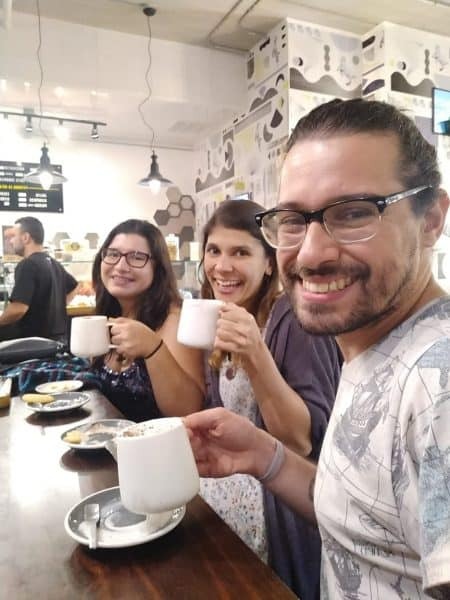 “We sell specialty coffee, and sugar is our enemy,” said co-owner and barista Mauricio Sanabria. So, during a chilly afternoon, couple of friends and I — a literal couple, they are very much engaged — asked for three Pastorcillos, and Sanabria set up the place for the show. The warm drink is prepared on the table. White mugs hold the cocoa and the barista brings out foamy jars of rompope that look like cappuccino coffee. That gets poured over until both ingredients mix together. The Pastorcillo is designed to overflow, and you have to make a wish while it happens. If the hot rompope slides from the right side of the mug, Cabra Negra’s superstition says it will come true. But if it doesn’t, it really doesn’t matter because you still get a good treat. 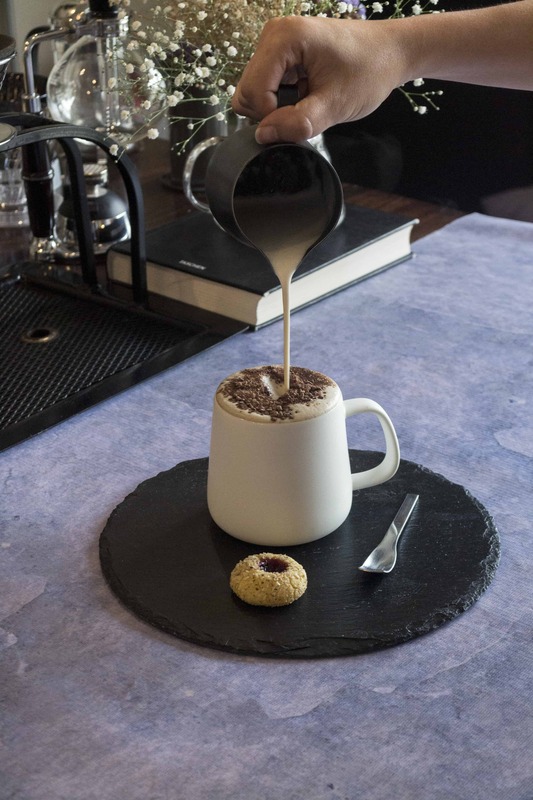 The barista will sprinkles the drink with dark chocolate and later he will advise you to eat the foam with a ladyfinger cookie. “It’s a visual experience and that seems to motivate people a lot. I have never seen another place that offers rompope like we do,” said Sanabria. While drinking, I also could hear that little snob voice on in my head: “This can’t actually be called rompope.” Well, technically it isn’t. It’s a hot punch sweetened with cocoa and foamed beyond recognition. “Are there any other songs that mention shepherds that aren’t carols?” asked Sanabria. This drink is Cabra Negra’s way of welcoming the holiday season, just like shiny lights do over the Paseo Colón. It’s just a tiny way of joining the celebration that everybody seems to do in their own way with food, decorations, and music. Wait until you hear salsa versions of every traditional Christmas song in existence at some store. And that’s exactly what makes Christmas in Costa Rica the greatest show. A delicious one, that is. Natalia Díaz is a freelance journalist. She likes her reading the same way she likes her music: with a side of gin and tonic. You can follow her on Twitter @natdiaze.